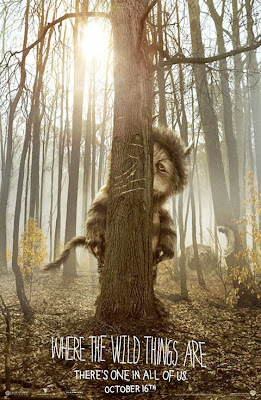 The kids film that isn't really for kids, Where The Wild Things Are is based on Maurice Sendak's 1963 much loved children's book, but turns it into a movie that is definitely aimed at a grown up audience. I've seen criticism of the films looks but for me Spike Jonze creates the world that the Wild Things inhabit perfectly and the Wild Things themselves are wonderfully brought to life with a mix of 'great big costumes' and subtle (how refreshing) CGI. Where the whole thing was always going to live and die though was the performance of Max Records who plays 'Max'. He is superb throughout, beautifully conveying the small boy with a vivid imagination and the you never doubt for a second that he'd be capable of conjuring up the wonderful world in his mind. A wonderful world that, in the end, satisfies his own inner demons. Max lives with his single parent Mother and older sister and clearly has problems fitting in with those around him. The film does a nice job of expanding upon the book with the opening scenes showing us Max's desire to be listened to and a brief attention seeking row with his Mother which leads him to run off from home and into the nearby woods. You are never shown the moment where reality segues into Max's imagination, he is running and suddenly there is the sea and a small boat and Max is off to a strange Island and it's seven strange grumpy creature, and I liked the ambiguousness of not seeing 'the moment'. It may also be Jonze's only nod to the children that might be watching. The Wild Things turn Max into their King and he sets about making them build a new home for themselves. Things go wrong and for Max as the Wild Things start to mistrust him and the movie also sags a little in the middle as Jonze attempts to expand on the, admittedly, short book. But despite this I was still captivated throughout. It's respectful of the book but it's also darker and more adult than I expected. Jonze draws you into the world that the Wild Things inhabit and although you'll grow tired of their child like ways you'll also get all watery eyed by the time Max decides it's time to leave them for home. There's also a great soundtrack by Karen O of the Yeah Yeah Yeah's that perfectly fits the look and feel of the film. Good stuff and what an ace movie to have gone to see on Boxing Day.